Please note: As this deal has now exceeded a £40,000 list price, this rate now includes the government 'luxury car tax'. For more information please click here. This will be taken at commencement of the contract. Typically, will be equivalent to 3, 6 or 9 monthly payments and is included in the total amount payable. This is the annual mileage allowance of the contract, which can be adjusted at the outset to suit your personal circumstances. Please note there will be a charge for any excess mileage change. Replacement tyres, brake pads and discs, wiper blades, battery, bulbs etc. Our vehicle data is provided by a third party and as a result, we would always encourage you to check the standard equipment on the vehicle configurator of the manufacturer's website prior to order. Find out everything you need to know on the new Ford C-max from independent vehicle review website Car And Driving. You can watch the video review to the left to see more of the car or read their written review below to get a true insight from an expert in the automotive industry. 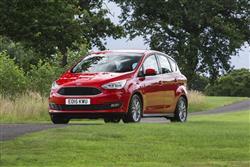 Ford's second generation C-MAX is brought bang up to date with a raft of improvements that family buyers will love. Jonathan Crouch reports. The Ford C-MAX compact MPV has been treated to a wash and brush up. Cleaner styling and engines are a big draw, with the introduction of a Focus-style dashboard and a 1.5-litre diesel powerplant that'll be the big seller here in the UK. Refinement has been improved and there are a stack of high-tech options to consider. Compromise doesn't have to be a dirty word. In fact, intelligent compromise is exactly what underpins the design of Ford's C-MAX compact MPV. Here's a car that needs to be big enough to fit family and luggage but not so big that it's too hard to pilot around town or park. It requires an engine with the torque to move a fully loaded car but not one that's so thirsty that the family purse strings are going to be stretched to breaking point. It would need all the modern safety and convenience features that buyers demand, but pricing that isn't out of reach of wage packets that already have school uniforms to buy and hungry mouths to feed. Hitting the sweet spot in all of those decisions and many others beside is where the expertise lies and is the reason why the C-MAX is one of the biggest selling cars in its class. Ford first introduced this compact MPV model in 2003 and since then has sold more than 1.2 million in Europe and currently holds a 12% market share. This heavily revised second generation model looks to make further inroads into the shares of rivals like the Citroen C4 Picasso, the Volkswagen Golf SV, the Renault Scenic and the Peugeot 3008. The C-MAX was always an easy pick for anyone who enjoyed driving. It was by far the best car in its class when showed a B-road. Now that the Golf SV is around, that superiority is no longer quite so cut and dried, but it's still a class act. Particular attention this time round has been paid to improving refinement. Noise, vibration and harshness have been improved through the use of thicker side glass and more absorbent seals around the tailgate and rear view mirror. The engine bay heat shield has been filled with acoustic damping material to reduce powertrain noise and diesel variants are equipped with extra acoustic seals to further reduce noise intrusion. A re-tuned dual mass flywheel helps to reduce shaking forces when the engine is under load, while revised engine mounts offer improved refinement during Auto-Start-Stop operation. The star of the engine line-up is the 120PS 1.5-litre TDCi diesel engine, seen for the first time in the C-MAX, replacing the old 1.6-litre unit. Power goes up by five per cent while emissions drop by six points. There are also the multi-award winning 1.0-litre EcoBoost petrol engines, offered once again in 100 and 125PS outputs. The big capacity diesel in the range is a revised 150PS 2.0-litre unit. The design of this C-MAX is evolutionary, with many of the details being brought up to date to reflect contemporary Ford thinking. The dynamic styling delivers a stronger, sleeker front end, featuring Ford's distinctive inverted trapezoidal grille. The washer jets have been hidden underneath the windscreen to give a cleaner look while the tailgate has been given a smoother and more sophisticated one-piece appearance. Inside, you'll find a dash that's a lot less fussy than the previous model, reflecting the customer-led design refinements that have already been executed on the Focus. There are fewer controls and switches, while the new black satin trim and chrome detailing contributes to a cleaner look. Functions are simpler to use, such as the air-conditioning controls that now feature buttons that are easier to recognise and distinguish from each other. Practicality improves too, with a redesigned centre storage console. The seats still tumble down individually in one motion to create a flat floor, with over 470-litres of space with all five seats in place. Prices start at just over £18,000 and range up to just over £26,000, so there's a model-for-model saving of around £1,600 over the larger Grand C-MAX model if you don't need that version's 7-seat capacity. Ford has gone quite big on electronic gizmos in this latest iteration of the C-MAX. The last model also had a lot of smart tech features and Ford rightly left most of them on the options list, giving customers the choice of whether they wanted to pay extra or not for these nice-to-haves. You can now get one of those tailgate openers which operate when you wave your foot under the bumper. These have always struck us as a little strange because if you're so laden down that you can't open the boot, are you really going to stand there doing one-legged manoeuvres? Anyway, there's also a perpendicular parking system and Active City Stop collision avoidance that operates at up to 31mph. Ford's latest Sync2 voice-activated connectivity system is also on offer, delivering smartphone sync and the chance to control some of the car's minor functions by voice command. The clearer eight-inch colour touchscreen is a welcome addition. Ford also bring us MyKey technology, which lets parents set a top speed and limit stereo volume in advance to prevent the young 'uns getting a bit overexcited. The diesel models really come into their own when you're willing to put some miles on the clock. If you want the C-MAX as a mere school run and shopping vehicle, you'd actually be better advised going for one of the economical 1.0-litre petrol models as they're priced so cheaply as to be a more cost-effective purchase. The 1.0-litre variants return 117g/km of CO2. Really leverage the economy benefits of the diesel engine though and you'll save big. The 1.5-litre TDCI diesel returns a combined fuel economy figure of better than 65mpg with 105g/km of CO2, which is excellent for a car of this size and with this much torque. Go for the 2.0-litre and it will also get around 60mpg. Insurance reflects the C-MAX's family owner profile, excellent safety and security record and low cost of repairs. The 1.6-litre model is expected to be rated at just Group 16E. Compare that to Group 19E for a 110PS diesel Renault Scenic. In truth, Ford didn't need to do a whole lot to the C-MAX to keep it right at the head of the pack. The improvements to the interior and the big efficiency gains leveraged by the 2.0-litre diesel, as well as the introduction of the 1.5-litre diesel, are all worthy updates but the overall look, feel and appeal of the C-MAX hasn't been markedly altered. Still, the arrival of new entrants into this market, most notably the Volkswagen Golf SV, means that if Ford had been content to rest on its laurels it could well have seen the C-MAX rapidly slip from grace. As it stands, this much improved second generation car looks to have what it takes to keep its rivals on its toes for some time yet. The more some things change, the more they stay the same. This is my second lease with SelectCarLeasing so I guess that says it all. Lee’s handling of the process end to end was superb, he’s a credit to your business. Having never leased a car I was very uncertain of how the process worked. My Sales Advisor Sam Malik was really patient, knowledgable and helpful and went out of his way to find me the right car and package to meet my needs and ensured that I received my new car within the appropriate timescales. The process in ordering and receiving the car was really well oganised and customer service was exceptional. I would wholeheartedly recommend this company. Great service .very helpful and alway kept me updated . Don't miss out!Want to receive our latest and best deals straight to your inbox? To be eligible for one of our offers you will need to be over 18 and approved for credit with one of our verified lenders. • Not every applicant may be eligible. • Information and prices are correct at the time of publishing which is subject to change. • All vehicles listed are subject to manufacturing availability. • All data listed comes from CAP database and subject to change. We will not be held responsible for any discrepancies in CAP data. • All offers are subject to availability/change and may be withdrawn at any time without prior notice. • Failure to maintain payments may result in the termination of your contract agreement and the vehicle being returned. • All vehicles images and descriptions are for illustration and reference purposes only. • Please visit the manufacturer's website for more accurate specification. • Terms and conditions apply. • Please be aware that you do not own the vehicle at the end of the contract. • The finance company/funder does not allow and do not sign up to support the activation of In-car Connected services within all vehicles (there may be exceptions to this - please enquire). Important informationTo be eligible for one of our offers you will need to be over 18 and approved for credit with one of our verified lenders. • Not every applicant may be eligible. • Information and prices are correct at the time of publishing which is subject to change. • All vehicles listed are subject to manufacturing availability. • All data listed comes from CAP database and subject to change. We will not be held responsible for any discrepancies in CAP data. • All offers are subject to availability/change and may be withdrawn at any time without prior notice. • Failure to maintain payments may result in the termination of your contract agreement and the vehicle being returned. • All vehicles images and descriptions are for illustration and reference purposes only. • Please visit the manufacturer's website for more accurate specification. • Terms and conditions apply. • Please be aware that you do not own the vehicle at the end of the contract. • The finance company/funder does not allow and do not sign up to support the activation of In-car Connected services within all vehicles (there may be exceptions to this - please enquire).